1. Sometimes it appears that the human mark on this planet is indelible. In only a blink of geological time, 200 years or so, human construction and expansion has resulted in the destruction of more than one-fifth of the world's forests, the recession of the polar icecaps, and the creation of a huge hole in the ozone layer. Additionally, industrial activity has damaged rivers and oceans, as well as groundwater supplies. Environmental scientists and activists warn that if Earth's future is not taken into account, humankind could very well destroy the planet. 2. However, Earth is an amazingly resilient place. In its 4.5-billion-year lifespan, Earth has endured bombardment by cosmic rays and meteors, violent earthquakes, volcanism, and frigid ice ages. In light of all these catastrophic events, many geologists and ecologists say that Earth could recover from any damage caused by human actions. 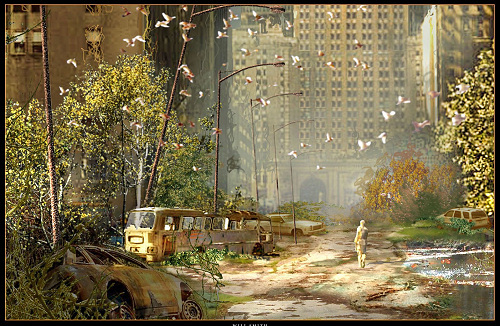 3.One theorist has gone so far as to predict exactly what would happen on Earth if all humans were to disappear. Without upkeep, the concrete jungles of the world's greatest cities would be slowly reclaimed by the wilderness around them. Harsh temperatures would cause pavement to crack. Plants would return to areas covered by streets and sidewalks. 4. Different fates would await humankind's other creations. Litter and leaf matter would accumulate, and it would take only one chance lightning strike to start a raging fire. Many structures would burn to the ground. The steel foundations supporting larger buildings and bridges would corrode and buckle, especially with the rise in groundwater that would accompany the clogging of sewer systems. 5. Without human interference, many of the threatened or endangered fauna would reclaim their ecological niches. Unfortunately, household pets would suffer. In addition, the rat, one of the greatest pests in large cities, would not have the waste of humankind to feed off of and would be hunted mercilessly by growing populations of hawks and falcons. And the cockroach, which to many a city dweller seems to symbolize invincibility, would disappear from all but the warmest climes without artificial heat to sustain it. 6. Within 500 years, again barely a heartbeat in geological time, most of humankind's monuments would be gone, covered over by plants and trees. It's happened before; the Mayan civilization in Northern Guatemala survived for 2,000 years but was swallowed up by the jungle at its end. And after a few thousand years, if earthquakes and volcanic eruptions have not obliterated everything made by humans, the glaciers would come, sweeping down from the mountains, slowly and inexorably destroying everything in their path. Several times in its history, Earth has been swept clean by these giant sheets of ice. The legacy of humankind would be wiped from Earth. 7. There is some evidence that this theorist's view may be true. Since 1953, a 150-mile-long tract of land separating North and South Korea has been declared a no-man's-land. After only a little more than 50 years, there is almost no trace of the rice paddies that farmers had created and used for almost 5,000 years. Even more spectacular are the flocks of red-crowned cranes that now inhabit the zone. These birds are the second rarest of all birds, but they have flourished in this area, free from human interference of all kinds. The purpose of this passage is to .